Most of us think nothing of grabbing a supermarket deal on our lunch hour. After all, surely this is a healthier option than just nipping down to Maccy D’s? However, a worrying new study suggests we all should be thinking much more carefully before grabbing a quick lunch. Have you ever been to an inner city tesco at lunch time and watched the suits battle it out in the meal deal aisle? Fascinating. The Tesco meal deal aisle is absolutely barbaric on a lunch time. Every man and women for themselves. Only the strongest survive. Queen Mary University of London based health campaigners Action on Sugar are now pushing for supermarkets and high street stores to remove sugary drinks and confectionery from meal deal choices. This is after researchers found some popular food and drink combinations from WH Smith and Tesco contain a tooth decaying 30 teaspoons of sugar, with findings launched to tie in with Sugar Awareness Week (30 October to 5 November). This is the equivalent of chomping down on 79 chocolate fingers and adds up to over four times what your maximum free sugars intake should be. Not good news at all for those wanting to maintain a healthy, happy bod. I’ve diverted from my usual boots meal deal… strong chance of the world exploding. Eating too much sugar is linked to obesity, type 2 diabetes, cancer and tooth decay. Supermarkets pretend to be on the side of their customer’s health to encourage loyalty, but this survey clearly shows that they are not. The government now needs to take decisive action to ban all promotions of unhealthy foods. WH Smith’s most sugary combination is the tuna and sweetcorn sandwich on malted brown bread combined with a 500ml drink Mountain Dew Citrus Blast and a Skittles Crazy Sours treat. If someone was to consume this meal deal every day over a working week, this would equate to a whopping 150 teaspoons of sugar (595g); more than a 1lb bag of sugar. Tesco’s worst offender is the Smokehouse Pulled Chicken sandwich with Mesquite Style Sauce, a 500ml drink of Monster Energy and a Mars Duo bar. With 30 teaspoons of sugar, this adds up to approximately 16 double chocolate mini muffins, which of course you would never consider munching down while sat on a city centre bench. Scarily, these weren’t the only places where it was possible to get an extremely sugary meal deal. Morrisons, Boots, Marks & Spencer and Sainsbury’s all stocked some similarly worrying combinations. Disturbingly, 7 out of 10 (72%) Morrisons meal deal drinks are marked as being high (red) in sugar. 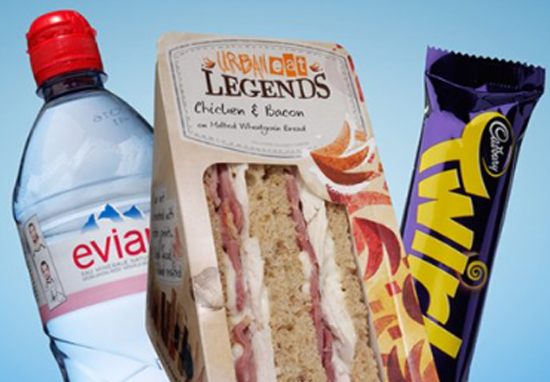 It is absolutely possible to make sensible low-sugar choices when picking your meal deal, however Action on Sugar believe much more could be done by leading retailers to encourage healthy consumer choices. Although many consumers are conscious of high calorie content, many don’t think about the dangers of high sugar content. This is something which arguably could be better promoted. It is time the government ensured that price promotions, including meal deals, only include healthier options. This year’s Sugar Awareness Week highlights just how much sugar is included on price promotion, which has been proven to make people buy more. The government has been running scared of the food industry for far too long, having eliminated price promotions from last year’s Childhood Obesity Plan. With such shocking statistics, will the government now work to address the way lunch deals are promoted and sold in UK supermarkets?